Today is the first day of National Work Zone Awareness Week. The theme of this year’s annual spring campaign is “ drive as though you work here.” And drivers would do well to listen. Surprisingly, the people that they put at risk by speeding are in most cases not construction workers. Of the nearly 800 people who lost their lives in work zones in 2017, 83% were not working on site. The people most at risk of being hurt or killed in work zones are just ordinary people driving by. Spring is an apt time to remind drivers to heed work zone speed limits as the construction season begins. 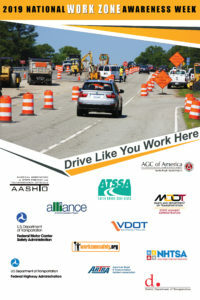 The awareness week’s kick-off event is being held in Washington D.C.. States across the country are also launching their own work zone safety awareness events and campaigns. At Traffic Logix, we work with DOTs all year long to encourage safer work zone driving with custom solutions like work zone radar signs and speed cameras. Our products help slow cars down in work zones so that the people working and those driving by are safe. Do Lower Speeds Make a Difference? 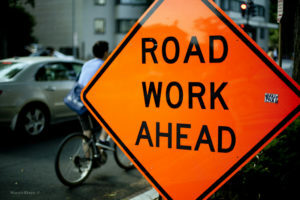 A study published by Oregon State University found that reducing vehicle speeds in work zones really does make them safer for construction workers and drivers. The study found that work zone speed signs successfully reduced the average speeds cars traveled at. When drivers saw their speeds displayed, most of them slowed down. And those few miles an hour can make a difference between life and death in a collision. The likelihood of someone being hurt in a crash is significantly reduced with every mile slower a car is driving. In work zones across the country, photo enforcement is being used to improve safety. States such as MD, OR, and IL significantly reduced speeds when speed cameras were installed in work zones. In fact, work zone speeding in MD was reduced by 90% with the help of speed enforcement cameras. Guardian speed cameras are a powerful tool to capture images of speed violators. These time-stamped images are automatically sent to anyone who speeds in your work zones. These violations are a powerful deterrent against speeding. Wondering how you can prevent speeding in your work zone? Try our interactive work zone tool to see how and what can make a difference.